Term Plans are an important step to take if you have people who rely on you. If you are the breadwinner or support other people, maybe family members or a spouse, then a term plan is a valuable safety net to have in case something were to happen to you. To help your dependents retain their lifestyle standards, it would be a wise decision to get a term plan that provides a huge umbrella of cover for a comparatively small premium. Aegon Life offers a variety of insurance plans to cater to the varied needs of customers. These plans are cost-effective and are also easily available online. With the term plan, the coverage offered can stretch up to the age of 80 years depending on the choice of plan offered by the insurer. The death benefit can be availed as a lump sum or regular income for 100 months, or a combination of both. Lower premiums are offered for non-smokers and women. You should be at least 18 years old and not more than 65 years. At the time of maturity, you should not exceed 80 years old. The minimum policy term available is 5 years. The maximum policy term is 62 years, with the option to stretch it up to 80 years. The minimum sum assured is Rs.25 lakhs. There is no upper limit specified. Premiums can be paid in one single payment or spread over the policy term. Premium frequencies available are single, monthly, semi-annual or annual. These riders offered by Aegon Life can be attached to a base plan. This can be done upon policy commencement or at any time during the term of the base plan. Aegon Life iDisability Rider – If the life assured faces permanent disability due to a sickness or accident, this rider will pay a lump-sum benefit plus waives off the future premiums payable under the base plan. Aegon Life AD Rider – If the life insured dies due to accident, the sum assured under the rider will be paid to the beneficiary. Aegon Life iCI Rider - Covers 4 critical illness conditions: Open Chest CABG, Cancer, first Heart Attack, and Stroke. A sum assured will be paid in the event of being diagnosed with any of these 4 critical illnesses. Aegon Life WOP Rider on CI - Covers 4 critical illness conditions: Open Chest CABG, Cancer, first Heart Attack, and Stroke. The cover will continue to be in force while future premiums payable under the plan and riders will be waived. Aegon Life Women CI Rider – This rider caters to specific critical illnesses pertaining to women. A certain percentage of the base plan cover will be paid out in the event the life insured is diagnosed with one of these illnesses. This term plan provides pure protection with the added benefit of return of premiums. If you survive the policy term, you will receive the premiums you paid. The entire premium paid towards the plan minus rider premiums, service tax and extra premiums, will be returned if you survive the term of the plan. The plan has an additional 25% sum assured benefit in case of diagnosis of a terminal illness on any one of the lives. Future premiums will be waived. This is capped at a maximum of Rs.100 lakhs. Claims can be made online even through the mobile phone. A nominee card will be issued bearing the details of the policy so that the claims process becomes a breeze for the nominee. Tax exemptions can be availed under Section 80C and Section 10 (10D). The plan can be availed online. Premiums can be paid monthly, semi-annually or annually. Policy terms are 5, 10, 15 or 20 years. The sum assured is Rs.30 lakhs to Rs.4 crore. Option 2 - 50% of sum assured paid immediately + 3% of the cover is paid every month for the next 5 years. The plan has an inbuilt accidental death benefit equal to 100% of the cover amount up to Rs.1 crore. You should be at least 20 years old and not more than 65 years. At the time of maturity, you should not exceed 75 years old. The policy terms available are 10, 15, 20, 25, 30, 35, 40 years and 75 years minus the age of entry. The minimum sum assured is Rs.10 lakhs. There is no upper limit specified. Premiums are spread over the policy term. Premium frequencies available are monthly, semi-annual or annual. Aegon Life TPD Rider – If the life assured faces total and permanent disability due to a sickness or accident, this rider will pay a lump-sum benefit. Aegon Life CI Rider - Covers 4 critical illness conditions: Open Chest CABG, Cancer, first Heart Attack, and Stroke. A sum assured will be paid in the event of being diagnosed with any of these 4 critical illnesses. Aegon Life Premium Shield Rider - Upon permanent disability due to accident or sickness, all future premiums will be waived under the base plan. To help you retain your family’s lifestyle in your absence, Aegon Life offers the Easy Protect Insurance Plan. The plan provides a life cover along with monthly payouts upon your demise. Upon the death of the life insured, the nominee will receive Rs.10,000 per month for the next 10 years. No medical tests are required to avail this plan. You should be at least 20 years old and not more than 50 years. Upon maturity of the plan, your age should not exceed 60 years. The policy term is 10 years. The minimum sum assured is Rs.12 lakhs. Premium payments are equal to the policy term. 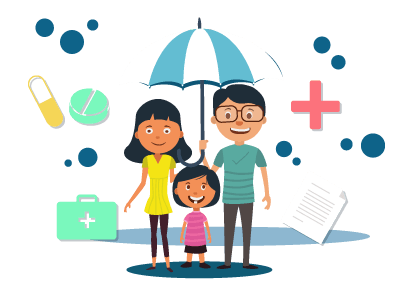 Why do you need Aegon Life Term Insurance Plans? A term plan is a type of life insurance plan that is valid only for a specified term. The premiums are low while the cover offered is high. The only drawback is that majority of these plans do not have any maturity benefit or survival benefits. This means that if you survive the term of the policy, the premiums paid will not be returned back. It is a one-time one-way payment made in order to be protected under the product. Some plans, however, provide a return on premium if the life insured survives the policy term. A term insurance plan provides peace of mind to the life insured knowing that their dependents are protected financially when they are no more. Aegon Life has a multi-channel distribution strategy that is designed to help customers plan their life and their future better. They offer a complete suite of insurance products to suit the different needs of customers. The insurer offers customised advice to enhance the overall experience the customer has with Aegon Life.